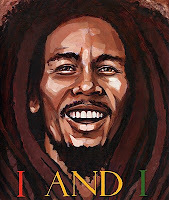 I and I: Bob Marley by Tony Medina, illustrated by Jesse Joshua Watson. Grades 4-8. Lee & Low Books, April 2009. Copy provided by my local library. In striking verses and vibrant paintings, Tony Medina and Jesse Joshua Watson have brought the man to life for a new generation. Bob Marley was born in Jamaica in 1945, son of an African Jamaican mother and a white European father. From the time he was a little boy, people knew Bob was special and they even though he might have prophetic powers. Truly, Bob was a kid who grew to be a teen who loved music and who saw wrongness in the world that he wanted to put right. He wanted to empower people to use peace and love to fix the ills of the world. This is an extraordinary book - beautiful in many different ways. Medina's poetry sounds like song itself. In the back of the book there is an explanation for each poem, giving some more information about Bob Marley or what was going on in the world at that point in time. Each poem is accompanied by Watson's gorgeous artwork. The paintings and the poems really work together to evoke emotions in the reader. 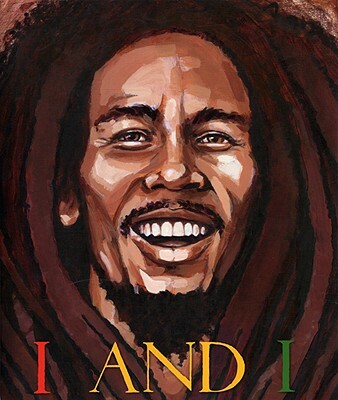 I and I: Bob Marley is creative nonfiction at its best. I hope to see this one sprinkled liberally with awards, come January. Read more reviews at A Fuse #8 Production (Betsy points out that the book includes mentions of the less-kid-friendly aspects of Marley's life [i.e. drug use and his many illegitimate children] in the notes), Biblio File, A Chair, A Fireplace, and a Tea Cozy, and The Happy Nappy Bookseller. Happy Nonfiction Monday! Check out the round-up over at In Need of Chocolate. Bob Marley is a Legend, glad you was able to learn more about him and you enjoyed it. I would recommend getting a greatest hits cd, his music is lyrical. I treasure Marley music thanks to several staff members over the years who taught me about it. Somehow I had missed the publication of this book, delighted to know about it!